The weather office has forecast heavy rainfall till Saturday. Thirteen of the 14 districts in Kerala are on red alert. 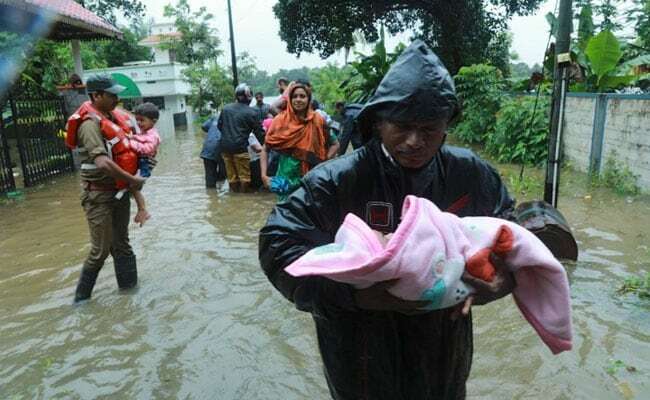 Kerala Rain: Over 90 people have been killed since heavy rains pounded Kerala. Over 300 people have died in Kerala - more than 100 of them in the last 36 hours - as torrential rain continues to batter the state. Prime Minister Narendra Modi will visit Kerala this evening. The military has pushed in more than 200 boats. Another four aircraft and three Coast Guard ships have also been brought in to rescue people marooned in areas cut off by vast stretches of water. All districts apart from Kasargod are under red alert, Kerala Chief Minister Pinarayi Vijayan said. "Heavy rains may affect these 13 districts. Everyone please be cautious," the tweet from his official handle read. The only district not under alert is Kasaragod. Idukki district is the worst affected. The Supreme Court has asked Kerala and Tamil Nadu to work out on the possibility of reducing the water level at the Mullaperiyar dam by three feet. 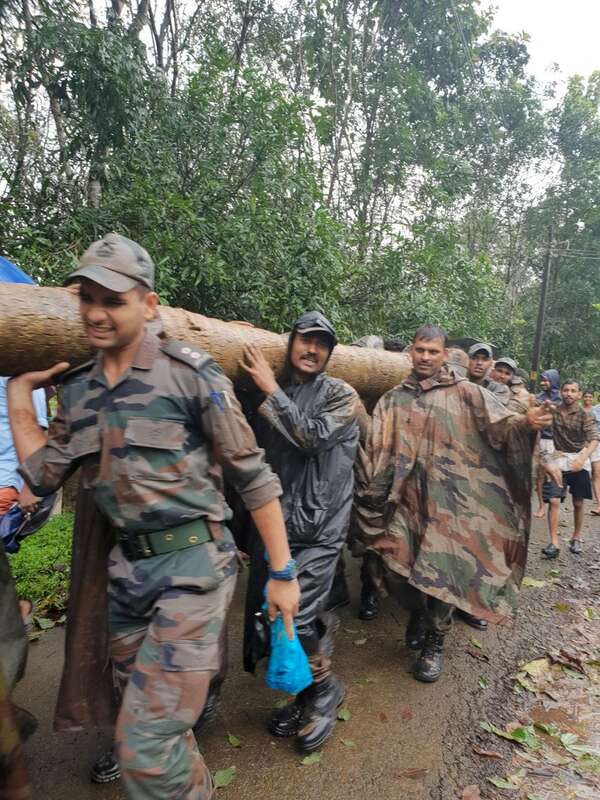 "Army has joined the rescue operation along with National Disaster Response Force, Fire department, Quick Response Team, among others," the Chief Minister's office said in a statement. Delhi Chief Minister Arvind Kejriwal said today that Delhi will donate 10 Crore to Kerala. The death toll from 10 days of floods in the state, a key tourist draw, has nearly trebled in the last 24 hours, news agency AFP reported. Over 300 people have lost lives in Kerala, ever since floods hit the southern state, Chief Minister Pinarayi Vijayan said today. Relentless rescue operations are underway in Kerala. Relief materials have been sent to 19 villages with medical aid being provided to around 500 civilians till date, according to official figures. In addition, 3,000 pre-cooked meals and 300 life jackets have been handed over to civil administration. Prime Minister Narendra Modi is expected to land in Kerala's Thiruvananthapuram by 9 pm today and will be staying at the Raj Bhavan. He will take an aerial survey of the flood-hit areas on Saturday. Chief Minister Pinarayi Vijayan told the media today that the situation continues to be grave. "The only good news is that rains have come down in certain areas of the state and we are planning to rescue all those who are waiting preferably by the end of this day." The Kerala government has requested for 600 motorised boats, the defence ministry said. the Indian Navy and Voast Guard will provide around 450 boats, it said, adding that the remaining boats will be taken on rent and provided by armed forces. The Supreme Court today asked the sub-committee to examine and find ways out and if possible to ensure that the water level in the Mullaperiyar dam won't cross 139 feet, news agency ANI reported. More boats have been deployed in Chalakudy, Chengannur and Pathanamthitta areas. 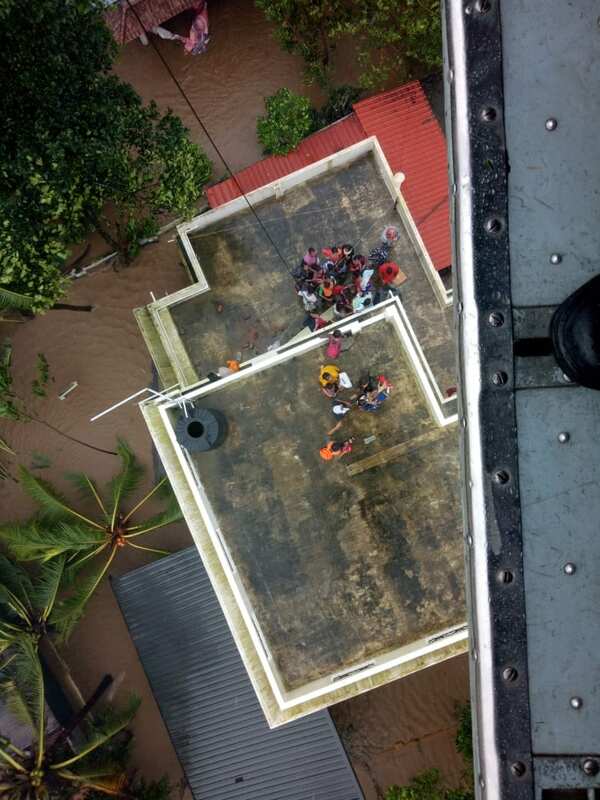 Two helicopters each were deployed in Chengannur and Pathanamthitta for rescue operations as it is difficult to carry rescue operations in boats. 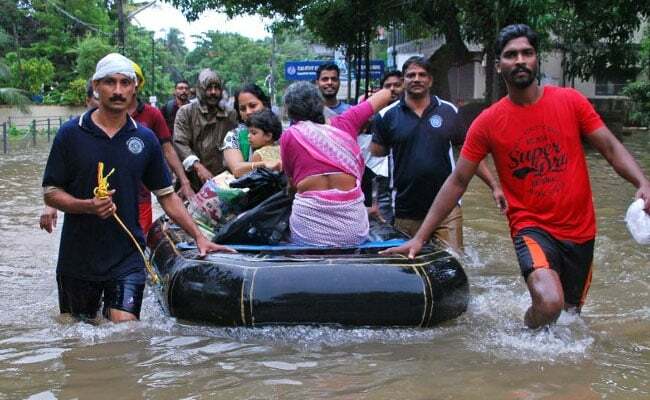 Around 3,000 people were rescued from Ernakulam and Pathanamthitta districts yesterday, news agency Press Trust of India reported. At least 167 people have died in rain-related accidents since August 8. "All districts apart from Kasargod are under red alert. The Meteorological Department warns that heavy rains may affect these 13 districts. Everyone please be cautious," Chief Minister Pinarayi Vijayan tweeted. 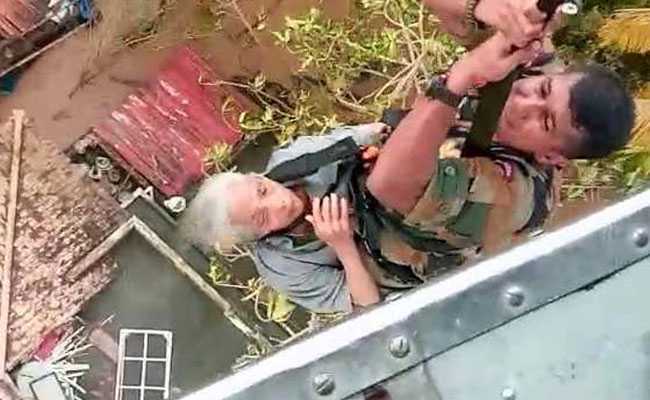 Visuals of a 101-year-old woman being airlifted in rural Ernakulam. Idukki and Ernakulam districts- one of the worst affected - have been inundated by the overflowing of Periyar river. Prime Minister Narendra Modi will visit the state following torrential rain and related floods and landslides, this evening. He will undertake an aerial survey of the state. Thirty people died yesterday as the state received 10 times the normal rainfall. Chalakudy town in Thrissur district turned into sea as river Periyar overflowed. 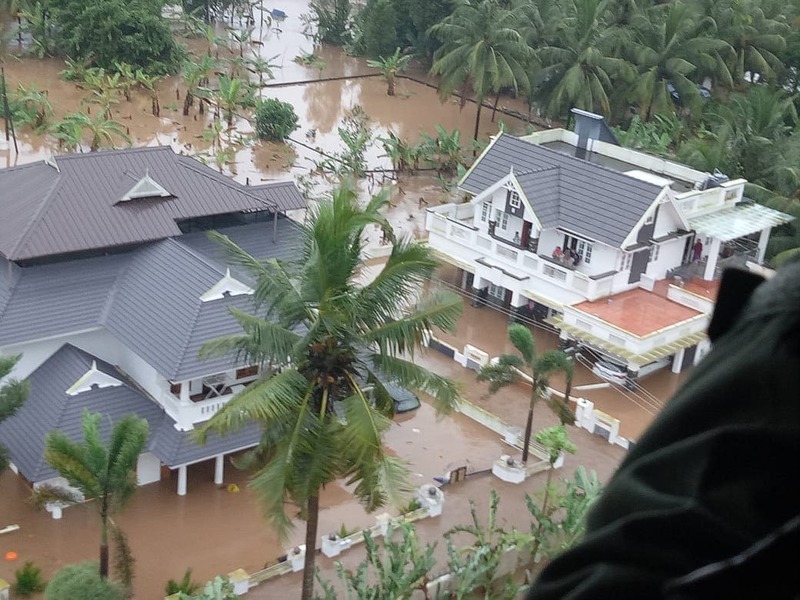 Pandalam town in Pathanamthitta district and Changanassery in neighbouring Alappuzha district are flooded as well." Nearly 100 people have died in rain-related incidents in the state since August 8. 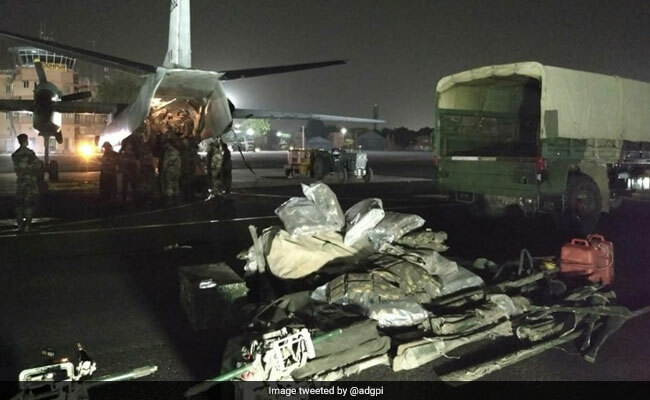 Around 15,000 people have been rescued in the last nine days by Army, while almost 170 people have been rescued by Indian Air Force in the last two days. All districts apart from Kasargod are under red alert. The meteorological department has warned that heavy rain may affect these 13 districts. People have been asked to be extra cautious. Defence Minister Nirmala Sitharaman said she has spoken with Kerala Chief Minister Pinarayi Vijayan. 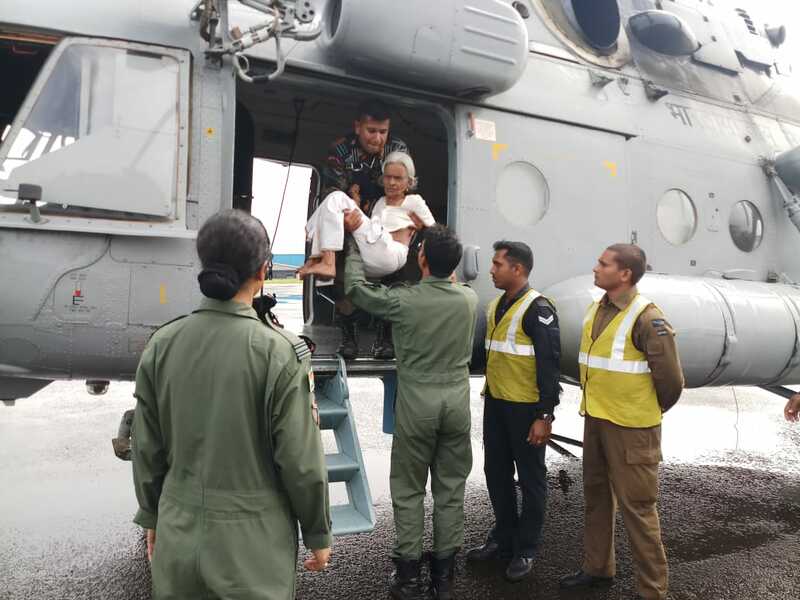 "Enquired if the required materials are sufficiently being provided and if rescue coordination is happening," she said, adding the chief minister requested for more helicopters. "Have instructed Vice Chief of Air Staff to provide the required assistance," Nirmala Sitharaman tweeted. 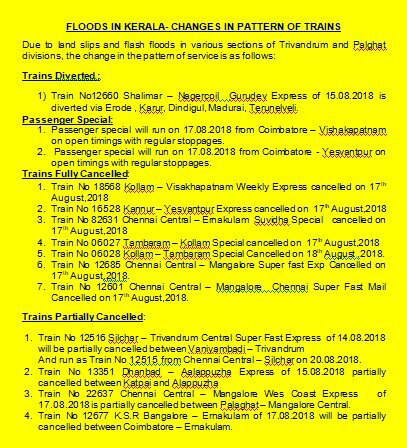 The railways said the Railway Recruitment Board exams will not be held in Kerala today due to the flood. "The exam at the Kerala centres is being postponed," said Rajesh Bajpai, Director, Information and Publicity, Indian Railways. BSNL is offering free on net and off net (20mins/day), SMS & Data to its customers residing in flood affected areas for the next 7 days beginning today. Art of Living founder Sri Sri Ravi Shankar tweeted that his organisation will provide full support in relief operations. "Spoke to the Chief Minister of Kerala Shri Pinarayi Vijayan and assured him the full support of the Art of Living with relief efforts in all flood affected areas of Kerala," he tweeted. 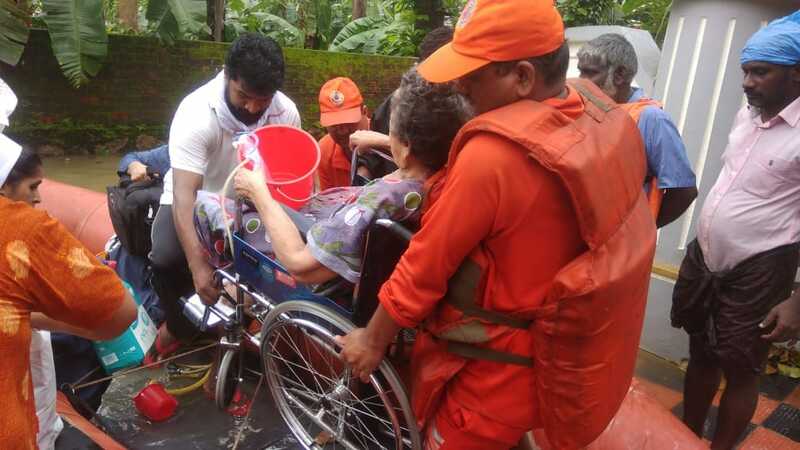 National Disaster Response Force (NDRF) team helping people at Kozhencherry in Pathanamthitta district. 5 units of NDRF (National Disaster Response Force) have reached Thiruvananthapuram this morning and deployed for rescue operations. 35 teams are expected to reach there today. Kerala flood: "Had a telephone conversation with Kerala CM Shri Pinarayi Vijayan just now. We discussed the flood situation across the state and reviewed rescue operations. Later this evening, I will be heading to Kerala to take stock of the unfortunate situation due to flooding," Prime Minister Narendra Modi tweeted. 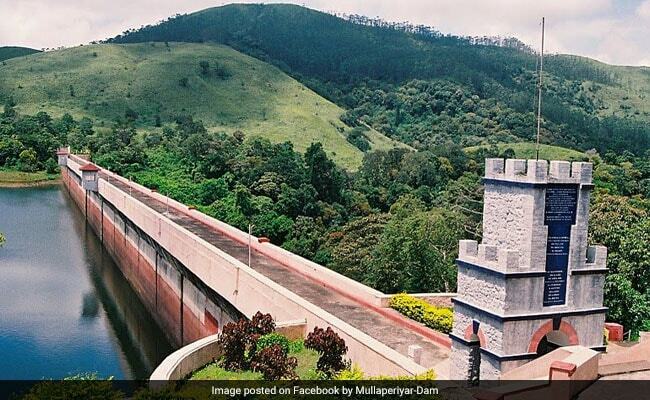 Tamil Nadu Chief Minister Edappadi K Palaniswami has written to Kerala Chief Minister Pinarayi Vijayan assuring that there was no threat to the safety of the Mullaperiyar Dam. In his letter to Mr Vijayan, the Tamil Nadu Chief Minister further said that the water in the dam was being stored at the permitted level of 142 feet as per the orders issued by the Supreme Court. "I would like to state that the Mullaperiyar Dam is in safe in all aspects hydrologically, seismically and structurally as per the Supreme Court order on May 7, 2014. During the past, the dam was inspected by many experts, on several occasions, and they had also found that the dam was safe in all aspects," Mr Palaniswami wrote. 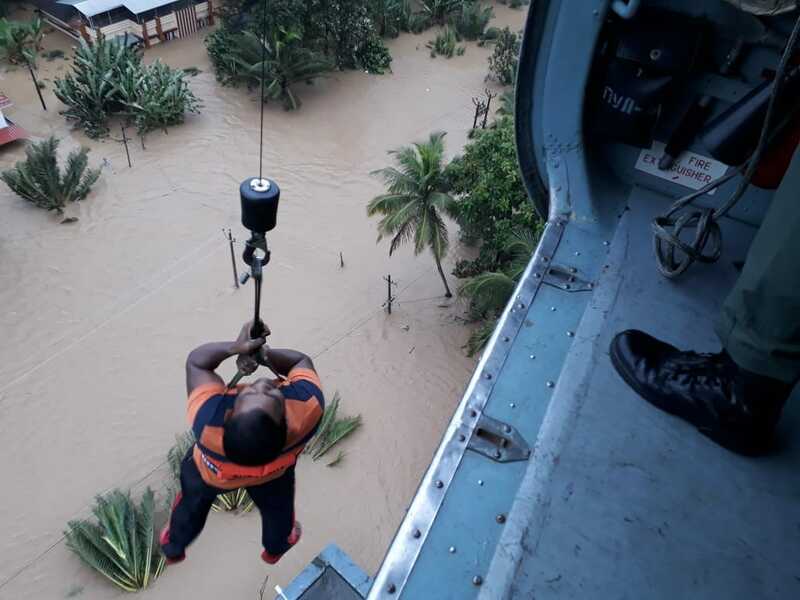 Twelve fresh teams of the National Disaster Response Force (NDRF) have been rushed by the Centre.Six teams each are being airlifted from Delhi and Gandhinagar (Gujarat) and they will be dropped at Thiruvananthapuram today, a force spokesperson said. Prime Minister Narendra Modi will visit Kerala and undertake an aerial survey of the flood ravaged areas on Saturday, Union Minister KJ Alphons said. 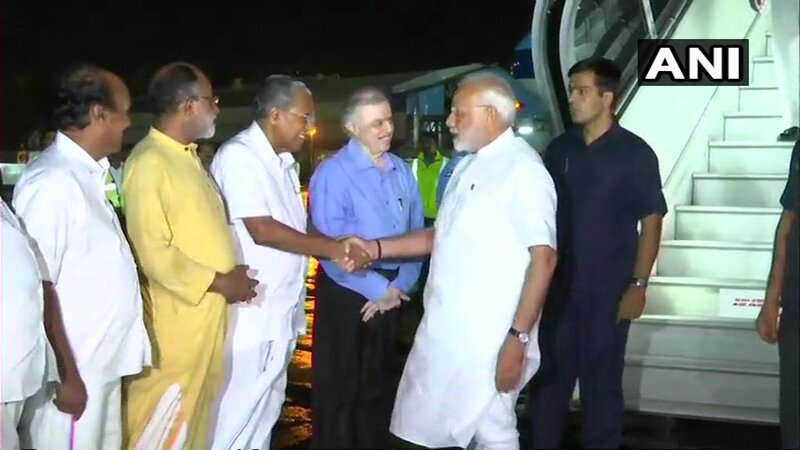 PM Modi was expected to reach Kochi on Friday after attending the funeral of former prime minister Atal Bihari Vajpayee. Food packets will be dropped from helicopters. More helicopters and equipment of NDRF arriving. Airlifting to begin by 9 am.